Activision may not be giving up Brütal Legend to EA without a fight—or at least a payout. Activision, which abandoned the game last year following its merger with Vivendi, thinks it still has publishing rights. Activision Adds Sierra&apos;s Spyro, Crash To Line Up; Ghostbusters, Brütal Legend Dropped? According to a report from Variety, Activision Blizzard has informed Electronic Arts of its claim to Double Fine's Brütal Legend, saying that it was still negotiating with the developer about its publishing plans. While everyone else seems to think differently—Activision Blizzard sure seemed to have shrugged the heavy metal-themed game off, like so many other Vivendi Games titles it absorbed—Activision thinks it's owed. Owed what? Certainly not the opportunity to ship such a risky title, as Activision Blizzard doesn't seem interested in publishing anything but the safest of safe properties. Variety theorizes, quite logically, that Activision simply wants to get money from EA. 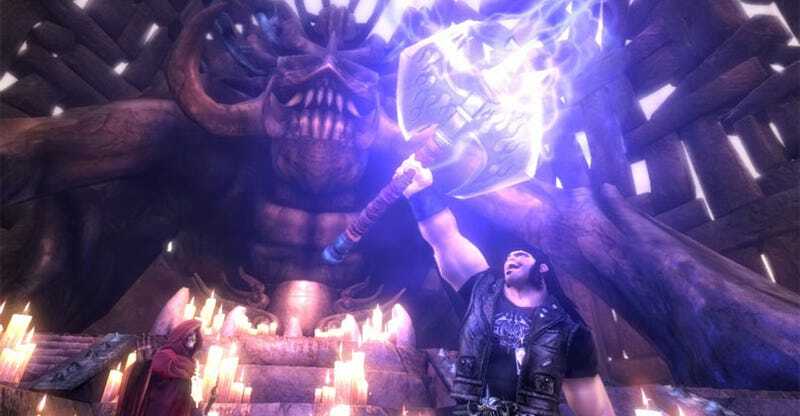 EA Well Aware Of Brütal Legend, Sees It As "Significant Risk"
Or maybe Activision simply thinks that since Double Fine founder Tim Schafer believes that Brütal Legend's existence was partially due to the success of Guitar Hero, there's some royalty owed. We're not lawyers! According to what we'd heard, Double Fine was under the impression that it was free to find another publisher, after the title contractually slipped through Activision's fingers. That publisher eventually turned out to be Electronic Arts. EA told Variety that it doesn't expect to be hit with a lawsuit, as that would be as ridiculous as "a husband abandoning his family and then suing after his wife meets a better looking guy." Oh yes. They said that. Variety has the full statement.